Granados, X.; Márquez, I.; Mora, J.; Fontcuberta, J.; Obradors, X.; Pallarés, J.; Bosch, R.
Pellets of YBCO HTSC have been used to construct a cylindrically shaped rotor. A four poles/four phases stator has been wound in order to build a motor. The motor behaves as an hysteresis motor when it starts and as synchronous in the steady state. The levitation forces associated to the flux inside the rotor region and the flux dispersed at the basal surfaces contribute to maintain the rotor anchored to its cavity in a self-sustained configuration. Power and torque in the synchronous regime, centering forces, static excitation field mapping and field distribution at the HTSC surface have been investigated. Granados, X. [et al.]. Hysteresis motor with self sustained rotor for high speed applications. A: European Conference on Applied Superconductivity. 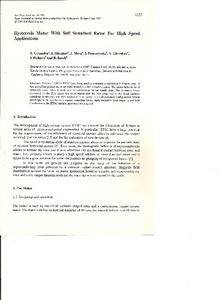 "Applied Superconductivity 1997". Holanda: Institute of Physics (IOP), 1997, p. 1527-1530.